How much does it cost to travel to Western Australia? How much money will you need in Western Australia? AU$142 ($102) is the average daily price for traveling in Western Australia. The average price of food for one day is AU$34 ($24). The average price of a hotel for a couple is AU$165 ($118). Additional pricing is in the table below. These average travel prices have been collected from other travelers to help you plan your own travel budget. How expensive is Western Australia? The vast expanses of Australia's largest state are meant for those looking to find a place in the world that's been virtually untouched by man. Western Australia is essentially the entire western third of the continent with most everyone living in the southwest near Perth. As the capital of this state, Perth is the most isolated large city in the world. With 2 million people living in and around Perth, this city sits in the middle of nowhere. There are less than 500,000 people living outside of the city creating that untouched atmosphere for the traveler looking to truly get away. The scenery in this area of the world is some of the most magnificent any nature lover can find. This untouched wilderness is as natural as it comes  the whole of Western Australia is like walking back in time. 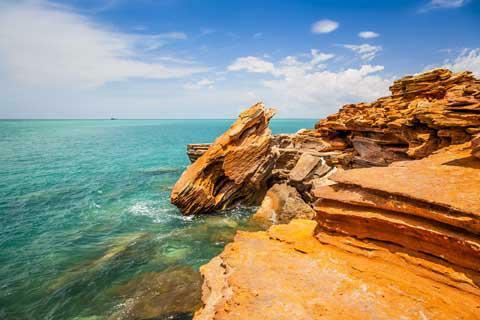 If you're looking to stay in the civilized regions, however, stay in the southwest near Perth and Broome with larger tourist attractions and accommodations. The state of Western Australia is divided into several regions. The region of Perth includes the state capital and its surrounding suburban areas. The Wheatbelt region is full of grain fields, and the Mid West has some excellent surfing beaches. Gascoyne has some tourist treats including the Ningaloo Reef and Shark Bay. The region of Pilbara is home to the mining region, and Kimberly has some of the most marvelous scenery in the country. Goldfields-Esperance is mostly barren flatlands with chills from Antarctica, and the South West region is the place to be for wineries, surfing and outdoor adventures. No matter what you want to do outdoors, you can do it in Western Australia. Just driving through the state can be it's own adventure. Take your four-wheel drive to the Captain Fawcett Commemorative for breathtaking scenery, Jarrah forests and historic farmhouses. Everyone knows divers dream of seeing the wonders under the waters of Australia. While it is not the Great Barrier Reef, the Ningaloo Reef near Coral By also has stunning corals, marine life and keep your eyes out for the whale shark. If you want to tackle this terrain by foot, there are plenty of hiking trails for you to travel. The Bibbulum Track covers the 1000 km between Perth and Albany. You'll pass through small towns, forest, wetlands, and grasslands. As you make your way through, there are plenty of campsites equipped to give you a magnificent night under the stars. There is also the Cape to Cape walk south of Dunsborough, the Munda Biddi Trail from Mundaring to Nannup, and the Railway Reserves Heritage Trail following the 40 km route of the former Easter Railway of the 1950s. If you are staying in Perth, finding a good meal will not be a challenge. If you leave the major towns, pack extra food. Finding resources is a little more of a challenge. IT wouldn't be a trip to Australia, however, without a few drinks. Micro-brews and pubs are all over Western Australia, and the locals will be happy to show you how it's done. Before you spend all your time on pints, though, remember the high quality wine in the areas vineyards. The Margaret River wine region is the well-known producer of premium wines in the state  try their Chardonnay and Cabernet Sauvignon. Another great option is Swan Valley jut outside of Perth. This is one of the first places grapes were grown for wine. With festivals and a wide variety of wines, Swan Valley is worth an afternoon. Leave yourself a lot of extra time for getting around Western Australia. If you plan on driving, be aware that if you plan to explore the more remote areas off the sealed highways, you're going to want to rent something with four-wheel drive. The state has a few sealed highways, and the roads referred to as "unsealed tracks" are not meant for the average driver. Also, take extra preparations on these roads. Gas stations, water and stopping points are few and far between. If you're looking to leave Perth, renting a car may be necessary. Trains services outside of the city and Mandurah are pretty limited.